“She is also entitled to receive aid for life under the Benefits for Dependents scheme, while her three children also qualify for the same scheme until they are 21 years of age,” said Zanurin. “However, we need SAJ to confirm that the deceased had been paid a salary for the past six months before we can start processing the applications. Helmi was a staff of Syarikat Air Johor (SAJ) Holdings Sdn Bhd here. “Socso representatives have met with SAJ which have agreed to give us their full cooperation on the matter,” he added. 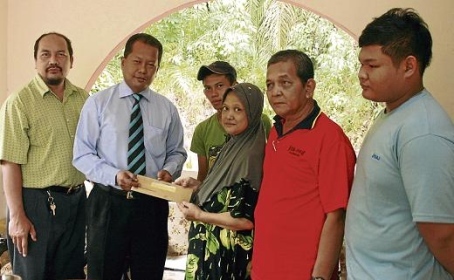 Wan Zabidah said she was grateful to SAJ and Socso for the financial aid. Wan Zabidah has two other sons aged 15 and 18, and a daughter aged 16. Helmi died after he was involved in a car crash at Km4, Jalan Mersing Nitar at about 8.30am. He was riding a motorcycle to work when he collided with a lorry. The victim succumbed to his injuries two hours after the crash.